For a while in college I was fascinated by the idea of driving and the metaphor of how the car becomes a part of one’s self – an extension of the inner self in a variety of ways. 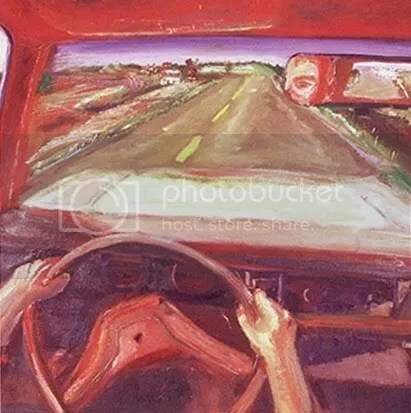 Much of my art since that time has revolved around the idea of the journey, and seeing the landmarks on the road we see daily both in cars and outside of them. Roads that parallel highways and exit ramps and overpasses – tunnels to new places, and exits and entries on the highway of life fascinate me both visually, spiritually, and emotionally. We are all on journeys every day. Do we take the time to see what we are passing or just let it pass us by? This entry was posted in 1999, art, artfolio, color, drawing, head, illustration, man, oil painting, painting, philosophy, religion, self portrait, Sketch Book and tagged Car, control, drive, driver, driving, oil, oil paint, oil painting, paint, painting, road, self image, self portrait by Jeff Thomann. Bookmark the permalink.